Western and Eastern medical practitioners consider good breathing habits to be essential components of health. Unfortunately, most people have poor breathing habits. They take shallow breaths, only use a portion of their lungs, even when they believe they are taking deep breaths, and hold their breath–especially when they become nervous or tense. Breathing well is vitally important to your health. No other health practice is capable of producing such dramatic and life-changing results, for the amount of effort put in, as the conscious practice of learning to breathe with your entire body in a relaxed, circular manner, without holding your breath. Breathing with the whole body has been used for millennia to enhance the ability to dissolve and release energy blockages in the mind/body, enhancing well-being and spiritual awareness. Breathing to create physical, energetic, emotional, mental and psychic power. However, they also have fundamental differences. Unlike pranayama, Taoist breathing emphasizes kidney breathing and lower/upper back breathing. The breath is always done with both nostrils and there is no breathing into the front of the chest. 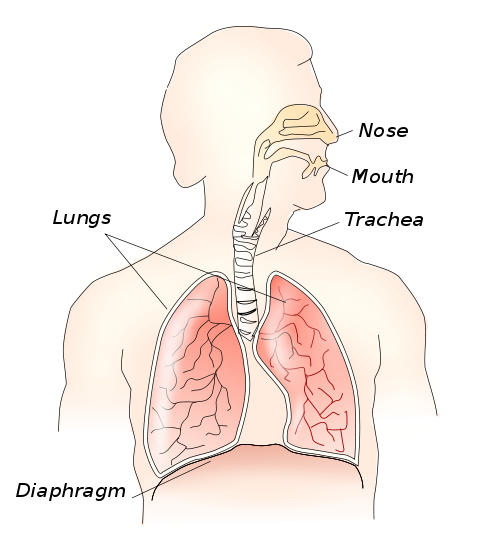 The major difference is that many core pranayama breathing techniques involve holding the breath. In Taoist breathing, you never hold or restrict the breath since it can create tension and thereby negatively pattern the nervous system–the exact opposite of Taoist breathing goals. 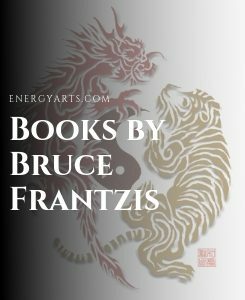 Energy Arts teaches a Taoist breathing system based on ancient, time-tested techniques used for centuries to improve the quality of your breath, help you feel more alive and build your chi. 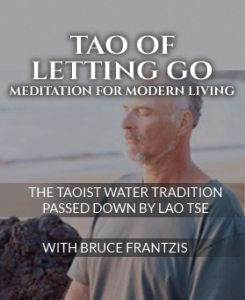 When I returned from my studies in China, India and Japan, I sat down and distilled all that I had learned about Taoist breathing into a program that makes these practices accessible to Westerners. These methods may be quite different from those that other teachers use to teach Taoist breathing. The basic techniques of Taoist Longevity Breathing gets everything inside your body moving and in sync with the rhythm of your breathing. It wakes up the inside of your body and makes it incredibly healthy. The methodology cultivates your ability to relax at any time and concentrate for long periods. The oxygen in your blood powers your metabolism, circulation and your ability to heal. Decreasing levels of oxygen make you prone to illness, morbid emotions and weak physical and mental performance. Most Western doctors recommend aerobic exercise as the best way to increase the volume of oxygen in your body. Taoist Longevity Breathing does the same. When qigong is practiced along with Taoist Longevity Breathing, the ﬂow of oxygen will become smooth and balanced throughout your body. Taoist Longevity Breathing gets rid of carbon dioxide and increases the usable oxygen that you inhale. Even if you can inhale sufﬁciently to pull in enough oxygen to your system, you might not exhale deeply or long enough to get rid of all the carbon dioxide in your body. For most people, a quarter or so reserve at the bottom of the lungs is always ﬁlled with carbon dioxide. This leaves only three quarters of the lungs free for oxygen intake on the next inhale. This causes the exhale to become even weaker, diminishing the body’s ability to procure oxygen from the air. Taoist Longevity Breathing helps you create and stabilize a strong, steady breathing pattern that will mitigate excessive emotional swings. It retrains your nervous system to relax and make your thoughts smoother and more comfortable. Studying your breathing patterns can make you aware of the ways your moods and emotions change. For example, fear tends to produce erratic, strained or weak breathing patterns. Holding the breath is often a preceded by violent, angry explosions. Likewise, holding the breath without realizing it is part of a reaction to stress and tends to increase its severity. Shallow breathing makes people prone to lung weaknesses in the face of environmental problems, such as polluted air, and can also lead to depression. According to Traditional Chinese Medicine, the ability of your breathing to improve the functioning of your internal organs–liver, kidneys, heart, spleen and lungs–is as valuable as increasing oxygen intake. Taoist Longevity Breathing methods transfer the pressure from air coming into the lungs to the internal organs, especially the heart. This provides a gentle yet firm massage for the organs while increasing blood and chi flow that helps to optimize their natural range of movement. Contrary to what most people believe, it is not your lungs that activate air intake. The diaphragm is responsible for moving air in and out of your lungs. So Taoist Longevity Breathing initially focuses on your diaphragm since it’s the starting point of breathing. However, for most people their diaphragm is not only frozen, but they also cannot feel it! Do you know where your diaphragm is located? How does it function? The diaphragm is a bell-shaped sheet of muscle that separates your lungs from your entire abdomen. It wraps around the lower parts of your rib cage and attaches to your spine. Your diaphragm moves when you breathe. The bell shape ﬂattens and your chest cavity and lungs expand and draw in air. When your diaphragm relaxes and resumes its bell shape, your chest gets smaller, causing air to be pushed out of your lungs. If your diaphragm does not move very much as you breathe, you cannot take in or expel much air in a single breath. Your diaphragm inﬂuences a complex variety of interconnected anatomical parts–upward to your head, neck and shoulders and downward towards the bottom of your pelvis–to move in coordination with it. Spongy, springy ligaments connect your diaphragm to your internal organs and cause them to move in coordination with your breathing. For example, if your diaphragm moves well, it also makes your liver move well. If the movements of your diaphragm are poor, it can cause the ligaments that connect to your liver to lose function. A poorly functioning liver will compromise all the other internal organs. Your body has several internal fluid-pumping mechanisms, which are directly connected to the movement of your diaphragm. Strong fluid movement is especially important for your internal organs, joints and spine. Poor movement of your diaphragm compromises the smooth flow of these fluids. Taoist Longevity Breathing exercises will help your diaphragm to move more strongly and train habits of long, robust and deep breathing. Soft, springy ligaments connect your diaphragm to your internal organs and help them function and move the way nature intended. For example, if muscles are flaccid where ligaments connect to the liver, both the ligaments and the liver itself will move progressively less, or even get stuck and barely move at all. This can, in a cascading effect, compromise the movements of your other organs. Since many of the fluid-pumping mechanisms of your body are connected to the movement of your diaphragm, poor or unbalanced movement of your diaphragm compromises these flows. Strong, rhythmic up and down motions of the diaphragm benefit and regularize these pumping actions. Breathing with your belly strengthens your diaphragm. However, the breathing technique must be learned systematically and gradually, and should only be done with an instructor skilled in monitoring these progressive stages. The connections between your diaphragm and heart, if excessively forced, could get overstretched or dislodged. Within Taoist Longevity Breathing, there are specific exercises for making sure that your entire diaphragm muscle moves as a whole while exhaling and inhaling. No part of the muscle movement should be significantly stronger or weaker than another. Another set of exercises within Taoist Longevity Breathing will teach you to lengthen and stretch your diaphragm as you inhale and exhale. Still other exercises will teach you to feel your diaphragm clearly and evenly during breathing to gradually increase and release pressure while evenly inhaling-exhaling. As you activate different parts of your body with Taoist Longevity Breathing, you will simultaneously lengthen your breath. 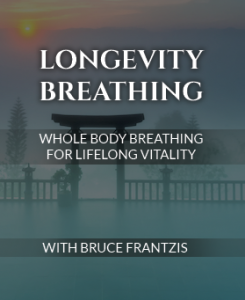 Increasing the length of your breath with Taoist Longevity Breathing will ensure that you move your belly and relax all the parts of your body. If you are tense or taking shallow gulps of air, then it is impossible to have a long breath. Over millennia, Taoists observed that a thirty-second breath was the minimum an average person should be able to do if he or she wanted to breathe well under normal circumstances. Yet given today’s low standards where having a weak, shallow breath is considered normal, being able to easily do a thirty-second breath may sound difficult to achieve. However, since you will take countless breaths from this day forward in your life, meeting this challenge will immeasurably better your life. As a point of reference, we estimate that the average person has between a three- and seven-second breath. So by training yourself to maintain a 30-second breath, over time you’d increase the length of your breath by at least 400 percent! Taoists also observed that the body made a positive and profound life-altering shift when practitioners could extend their breath to two minutes. This causes major changes in the body and positively resets many of the body’s energetic baselines. For example, the circulatory and nervous systems shift to another level of capability, which most people don’t even know exists. Even if this ability is maintained only for a year, it usually causes a beneficial effect that lasts for decades. This ability can allow the practitioner to regularly shrug off stress that would otherwise be overwhelming and cause misery and poor health. China is a nation that historically has revered their elderly and their accumulated wisdom. Consequently, the Taoists were greatly concerned with promoting longevity and became renowned for their longevity practices. An essential component of their most successful longevity techniques os called “turtle breathing,” which is an eight-minute breath. Giant turtles are known to live for hundreds of years. They commonly submerge themselves in the water and hold their breath for more than five minutes at a time. One breathing aspect of Taoist breathing is aiming to generate a five- to eight-minute breaths. This practice is unsurpassed in its ability to transform and maintain the vitality of youth as the body and mind age. The Taoist science of how energy moves in humans comes from the 16 components of neigong, or internal energy system. Breathing plays a primary role in the system, is the foundation for all of the other neigong components, and is the first neigong component. Breathing methods can go from simple to much more complex as you progress in your learning. Once these advanced breathing methods are learned, they can be incorporated into any internal energy practice such as taichi, qigong and bagua. In the beginning stages of Taoist Longevity Breathing, you train your breathing mechanism until every internal part of your body is consistently and powerfully engaged in the breathing. This phase requires effort and consistent practice. It involves learning to breathe with your belly and abdomen and to bring air all the way up your back to the top of your lungs. 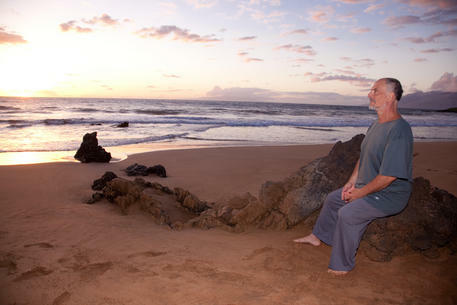 In the intermediate phase of Taoist Longevity Breathing, you will learn more complex methods. You will focus on getting your breathing to become progressively longer, softer and more silent. As you do so, the tightness and constrictions in your breathing mechanisms will gradually loosen and begin to move effortlessly with large amounts of motion. One day, you will have strong, deep, quiet and effortless breathing rhythms that you do not have to think about. You also learn Taoist reverse breathing where all parts of your body move in synchronized fashion with your inhales and exhales. You learn to breathe from your skin and use your breath to open, strengthen and stabilize your etheric body. 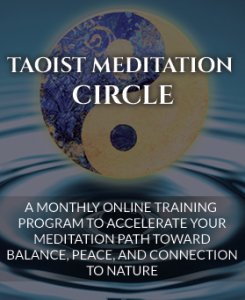 You will learn Taoist circular breathing using your upper lungs, spine and lower tantien and how to integrate your breathing with any qigong exercise, using the other components of neigong. The eventual goal is to be able to breathe chi in and out of any body part at-will and through conscious intent alone. The object with this type of breathing is to wake up your lower tantien so you can feel it. This kind of breathing has progressive stages. Stage one of breathing will teach you to have a very clear sense of breathing directly into your tantien, the energetic center of your body. The next breathing stage will teach you to feel whether the pressure of your belly expanding and contracting from your tantien might be unbalanced and, if so, how to balance it. Practicing these breathing exercises will expand your awareness so that you can notice all the minor variations of tension and contraction that occur as you breathe. The next stage will teach you to breathe from your tantien in two or more directions simultaneously in several ways. In Taoist regular breathing, your belly expands as you inhale and shrinks when you exhale. In Taoist reverse breathing, you do the opposite-shrink your belly when you inhale and expand your belly when you exhale. Taoist reverse breathing is sometimes called pre-birth or womb breathing, because it is how babies breathe chi in and out of their bodies while in the womb. 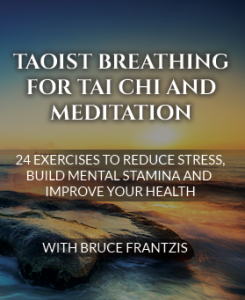 The goals of Taoist reverse breathing include becoming aware of and controlling the subtle physical and energetic movements of your body so they deliberately occur in rhythm with your breathing. Every physical part and energetic function within your body, and etheric body or aura, will move in coordination with the expansions and contractions of your belly. Taoist reverse breathing opens, strengthens and stabilizes the aura and is integral to one aspect of what Lao Tse called “Breathing from the Heels,” which, within Taoism, is considered to be the only truly complete breathing process. Taoist spinal breathing opens and strengthens your spine and all the energies connected with it. Spinal breathing is taught in stages. One stage involves energizing your spinal nerves and begins the process of connecting your spine’s energy to your brain and upper tantien. Another stage involves using your breath to move chi smoothly between your spine and the boundary of your etheric body. Another stage will also teach you to smoothly and evenly move cerebrospinal fluid and energy within your spinal cord and up and down your spine. Taoist circular breathing is the smooth, seamless flow of chi through your nervous system during your inhales and exhales and most importantly during the change between them. It is an important quality of more advanced Taoist methods to link your breathing to physical movement and energy flow. Your breathing (inhales and exhales) should have no distinct starting or stopping points. Become aware of the underlying quality or feeling of your nervous system as you breathe. Focus on the conjoined quality of your breath and nervous system as you inhale and exhale. Find any gross gaps in your breathing, particularly at the changeover point between inhales and exhales. Train your awareness to become increasingly subtle and conscious of the micro-gaps in your breathing. Make your breaths go progressively sung, or relaxed. As this occurs, become aware of even more subtle gaps that cause your nervous system to freeze momentarily during your practice. You will train until your nervous system becomes completely smooth and seamless and the difference between inhales and exhales disappears. The goal in the last phase of Taoist circular breathing is to directly find your chi. Having your breath be seamless and smooth can be the doorway to finding your chi; just as finding your chi is the doorway that can enable your breathing to become truly circular. They are interconnected and cannot be separated. The task now is to make the jump from being only indirectly aware of your chi by its reflections in your breathing, nervous system and body (this is the goal, or focus of the book Opening the Energy Gates of the Body), to becoming directly aware of chi as a separately-felt entity that empowers all movements in all your systems. Awareness of subtleties and intentionality is a wonderful tool. As it becomes stronger and more refined it allows you to recognize and direct your energy in ways that otherwise would be impossible. As you practice more and your breathing becomes seamless, the barriers to being aware of chi dissipate. Gradually, with more and more breathing practice, your awareness will learn to fully penetrate your nervous system and become exceedingly familiar with it. When this happens the last barriers to your breathing being fully circular will disappear. Eventually, your awareness will be able to recognize the underlying separate qualities of your breathing, nervous system and chi. You will become aware of the subtle current which interlinks all three. You will experience how your chi affects, is affected by, and is the underlying force that joins and controls your nervous system and breathing. One day, as you focus on your breathing, the air coming in and out of your nose will seem to slow and then stop, while the insides of your abdomen and lungs will continue to move very powerfully. Even though you will be physically breathing well, it will seem as though your physical breath has gone totally silent and completely stopped and your body and mind have also spontaneously become silent. An eerie silence and sense of incredibly expanded and empty space will arise within your body and mind. Suddenly you will find yourself silently breathing chi in and out. Then, this too will seem to slow to a stop. One day, during the circular breathing process your body and mind spontaneously will again become even more silent. Even though you will be physically breathing well, it will seem as though your breath has gone totally silent and completely stopped. Within this space your sense of air movement will be gone but your organs will restart opening and closing (expanding and condensing) as though they have an independent will of their own. Now, instead of air being moved in and out of your nose, each expanding and condensing of your internal organs will bring in and expel something. This is chi. After becoming experienced with this for a while, you will have gained the foundation to gradually become able to directly move chi anywhere in your body by conscious intent alone, using all the components of neigong.